We're finally at less than one month til hubby's next race day. 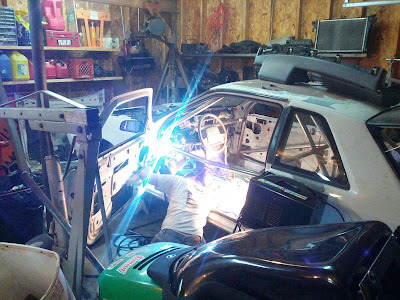 The car is coming together (they say..). New boxes and supplies arrive at our house every day. A giant pink tent for the campsite, various toyota oem parts and other miscellany I'd never recognize. As far as I can tell, the car is finally looking like, well, a car. There's an engine in that front [previously] open part, and a set for the driver to park his pockets in (this is how one talks when most of one's time is spent with one or more kindergarteners ;) ).